I have a 2 payment system set up. 200 at booking then balance due 60 days prior to arrival. I had a guest who needed some extra time to pay and I agreed. Last night, her card was charged "automatically" and over drew her acct. I'd rather have guests authorize each payment VS automatic charges to their accounts. There are two options you can do for this. First off, you can alter the settings on any given booking or quote. The Payments tab on the booking shows what is scheduled, and you can add or remove scheduled payments there. In this case, you could have removed the scheduled payment or change the date on it. Or go to the Rules tab to control the schedule for the second payment. 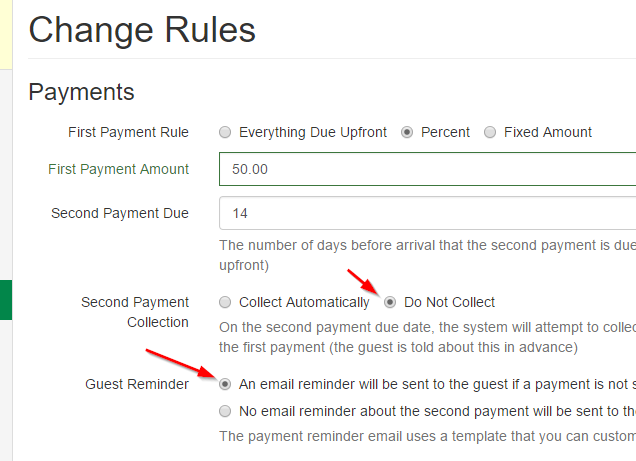 If you want to turn off automatic payments entirely for future quotes/bookings, you can do this in the Rules section of the property. Set the collection to "Do Not Collect" vs. "Collect Automatically" and make sure that the email reminder is enabled. That will send the guest a notification email with a payment link vs. charging their card automatically.